We are one of the most revered firms, manufacturing and supplying an impeccable assortment of Digital Melting And Boiling Point Apparatus. 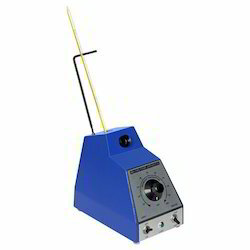 - Accurate Determination of Melting Point of solid sample and boiling point of liquid samples. All Aluminium Body Usage for Determination of BoilingPoints.Temperature:Room Temp. to 350º C Heater block accepts tubes & Mercury Thermometer Heating by two elements clamped to the sides IIIuminium & View : The built- in lamp & Magnifier Lens Temp.Control : Energy Regulator. Specifications Temperature range: Room temperature + 2 °C - 300 °C. - No of capillary tubes: 1 for Melting Point. - Capillary: length -75 mm; Diameter: 1.4 – 1.6 mm. o Precision Melting / Boiling Point Apparatus in 250ml beaker silicon oil bath. Teflon dish cover. o 12V long lasting immersion heater connected to transformer in order to give quick heating & fine calibration, no shock hazard.